Before European settlers arrived in North America, the Atlantic salmon began life and spawned in freshwater rivers and streams along the northern Atlantic coast of North America. The southern boundary of their original range was Connecticut's Housatonic River and the northern boundary was the Ungava Bay in northern Quebec. With the European settlers and the industrial revolution, however, came dams that harnessed the power of rivers and even small streams. As beneficial as these dams were to man, they were equally detrimental to the fish species that traveled up and down these rivers, including the Atlantic salmon. In the two centuries since that time, man has made various attempts to restore what he lost. Before the 1960s, sporadic attempts to restore the Atlantic salmon to the Connecticut River system were unsuccessful. However, in 1967, the Anadromous Fish Act was passed, and the beginning of the current effort to restore these species began in earnest. By the late 1970s, this effort began to show success. It was at this time that the Whittemore Salmon Station was built in Barkhamsted, Connecticut. In 1981, the facility began accepting its first returning adult Atlantic salmon and took its place in a network of facilities, agencies, and people dedicated to restoring Atlantic salmon to New England. The restoration program is a cooperative project undertaken by the four states in the Connecticut River basin - Connecticut, Massachusetts, Vermont, and New Hampshire and the federal government, represented by the U.S. Fish & Wildlife Service, the National Marine Fisheries Service, and the U.S. Forest Service. These entities formed the Connecticut River Atlantic Salmon Commission (CRASC), which manages the program. The states are represented on CRASC by the natural resource agencies and in Connecticut that means the Inland Fisheries Division of the Connecticut Department of Environmental Protection (DEP). The Division built the Whittemore Salmon Station, the Rainbow Dam Fishway, and other facilities in the state to support the restoration program. It carefully coordinates its activities with its sister agencies in CRASC. Fish like salmon are known as anadromous, meaning they hatch in fresh water, live most of their lives in salt water, then return to fresh water to spawn. Fish that have the reverse cycle are called catadromous. The Atlantic salmon begins life in late spring in freshwater streams and rivers in the northeastern United States and eastern Canada and in northern Europe. When they first hatch they are called alevins or sac fry. After three to six weeks, as they emerge from their river bottom gravel nests, they are called fry. As the fry develop camouflaging color and stripes, they are known as parr and generally measure about two inches in length. They remain in this stage of their life, growing and feeding in their native stream, for anywhere from one to three years, at which time they become smolts. The smolt stage is when the Atlantic salmon adopts the silver color needed for sea camouflage and when their body chemistry changes for life at sea. Weighing just a couple ounces and measuring about six inches long, they head out to sea. In our area, the fish travel down their native stream to the Connecticut River, down the Connecticut River to Long Island Sound, then northward through the Atlantic Ocean to the Davis Straits, located between Labrador and Greenland, a journey of approximately 3,000 miles. The north Atlantic is the adult range for Atlantic salmon from the U.S., Canada, and Europe. Salmon traveling from the Connecticut River have one of the longest journeys of all the Atlantic salmon, coming from the southernmost tip of their habitat. Salmon spend one to three years in the north Atlantic feeding, growing, and maturing, before getting ready to spawn. When they are ready to spawn, they generally weigh anywhere from eight to 15 pounds and they begin heading back to their native stream in early spring. They find their way back using their sense of smell. Each stream whether the Farmington River, Morgan Brook, or Sandy Brook possesses a unique chemical identity based upon the combination of factors within its watershed: soil types, forest types, bedrocks, plant communities, etc. These factors produce an odor discernible to parr and smolts living in these streams and the fish memorize this odor both as they live in their home stream and as they emigrate downstream to the ocean as smolts. Innate guidance draws the adult salmon back to coastal waters but once close to the mouth of the home basin (in our case, the Connecticut River), the fish's sense of smell takes over and it "follows its nose" upstream to the familiar scent of its home stream. Northward they swim, up the Connecticut River, and then they take a left turn into the Farmington River in Windsor. Before dams were built, they would continue until they reached the spot of their origin, perhaps the West Branch of the Farmington River here in Barkhamsted, or Sandy Brook in Colebrook, for example. Now however, they swim only as far as the Rainbow Dam in the Poquonock section of Windsor. Throughout May and June, they enter a fish passage built to enable fish to swim upstream past the 60-foot hydroelectric power generation dam. This fish ladder is closely monitored by the DEP. Photos above (taken June 2003)- At left, the Rainbow Dam in Windsor, Connecticut. Because anadromous fish like the Atlantic Salmon could not bypass this 60-foot obstacle in their path back to the Farmington River, the DEP built a fish ladder to help them around the dam. Photo at right- the fish ladder, or fishway, that enables returning fish to get around the 60-foot high Rainbow Dam in Windsor. 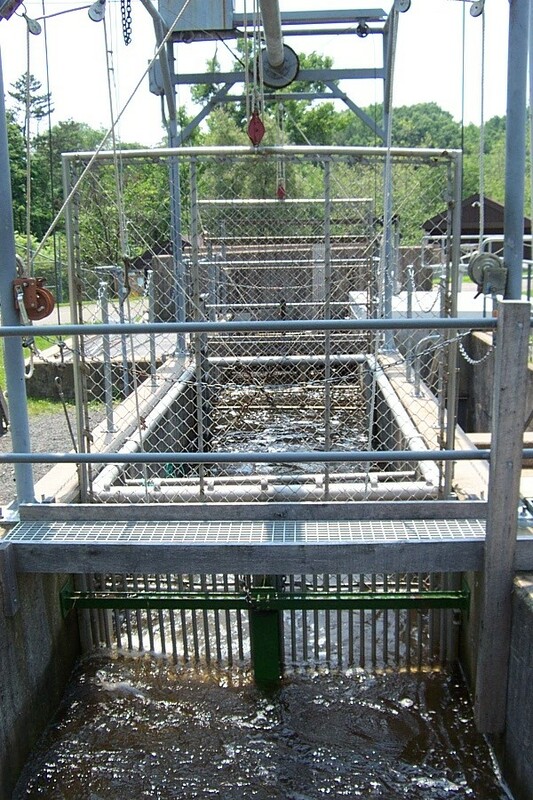 Photo above- This trap, near the bottom of the fish ladder, is monitored closely and used to catch returning Atlantic salmon. Once a salmon is caught here, the Whittemore Salmon Station staff transport the fish back to Barkhamsted. When a returning adult salmon is captured, Joe Ravita or Andy Murrett of the Whittemore Salmon Station gets a call and heads out in a specially prepared fish transport truck to pick up the weary traveler. The fish is transported by truck to Barkhamsted, where it is held throughout the summer at the Whittemore Salmon Station, in closely regulated tanks that simulate the environment of the Farmington River, where the fish would have spent the summer if man had never intervened. During this phase, the salmon do not eat. 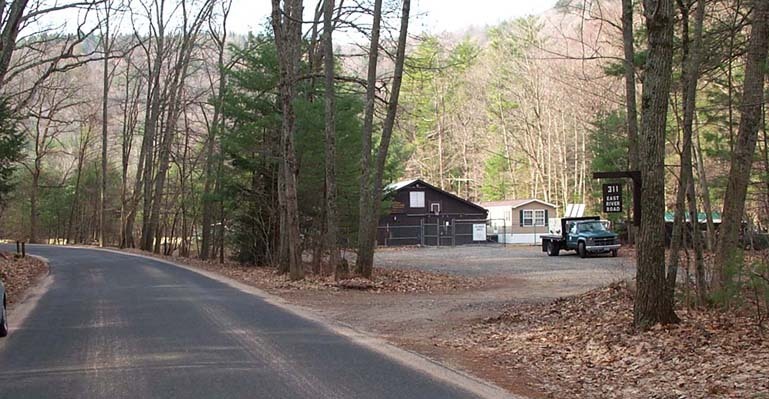 Photos above (taken in April 2003)- The Whittemore Salmon Station located on East River Road, Barkhamsted, in Peoples State Forest. In the fall, the returning adult salmon spawns, laying eggs in a gravel nest (called a redd) at the bottom of its native stream. Or would, that is, if it weren't for the DEP. 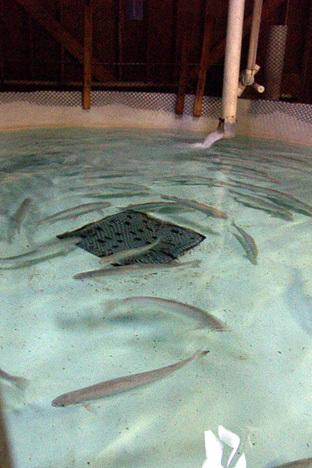 Nowadays, the fish spawn at the Whittemore facility in the fall, and their eggs are transported to White River National Fish Hatchery in Bethel, Vermont for incubation and hatching. The Vermont facility incubates the eggs because it can regulate its water temperature more tightly than the Whittemore facility allows. In nature, fish that have spawned, called kelts, might spend the winter in their native stream (still not eating) and return to the ocean the following spring, or they might make the seaward journey in the late fall. Once back in salt water, the fish begin to eat again and return to the north Atlantic. The Atlantic salmon, unlike Pacific salmon, make this journey back and forth to spawn for as many as seven years. But the journey back and forth is 6,000 miles and full of peril. Predators, fishing, and oceanic conditions jeopardize the adult salmon during its lifecycle. After nearly 20 years of successfully increasing the number of returning Atlantic salmon, the anadromous fish restoration program has seen declining numbers since 1998. This decline is due to a wide range of factors, such as changing ocean temperatures (a change of as little as 0.5 degree in average ocean temperature can affect the salmon's ability to survive), predation, fishing, and even fish farming. Even the success of other fish restoration efforts, such as the striped bass, can affect the salmon since striped bass eat salmon smolts in Long Island Sound. NOAA estimates the historic Atlantic salmon return to U.S. waters approached 500,000 fish. The Atlantic Salmon Federation estimates the number of adult Atlantic salmon available to return to the North American rivers dropped from 200,000 to just 80,000 between 1994 and 1999 alone. This drop is the continuation of a pattern that has occurred through the last 50 years. Closer to home, Northeast Utilities counted 91 returning Atlantic salmon at the Holyoke fish passage in 1999. According to the Connecticut River Salmon Association Newsletter, only 76 adult salmon returned to the Connecticut River in 2000. In 2002, just 43 adult salmon were counted at fishways on the Connecticut River. With an unusually cold and rainy spring, yielding high river flows, the numbers for 2003 are likely to be similar. While specific causes for this decline in returning adults is unknown, most organizations agree that a complex web of declining marine conditions are to blame. "It's death by a thousand cuts," says Frederick G. Whoriskey, Jr., Vice President for research at the Atlantic Salmon Federation. On the bright side, progress continues to be made in combating over-fishing of the Atlantic salmon. The United States discontinued this practice in the 1940s, Canada discontinued it in most areas during the 1990s, and Greenland just agreed to suspend commercial fishing of Atlantic salmon in August 2002, leaving just United Kingdom and Ireland with significant commercial fishing operations for Atlantic salmon. This reduction in fishing in the north Atlantic may increase the number of fish that survive to return to our area in the future. Another hopeful sign for the Atlantic salmon is the recent renewal of the Connecticut River Atlantic Salmon Compact, signaling another 20-year commitment to restoring Atlantic salmon by the states of Connecticut, Massachusetts, New Hampshire, and Vermont, the U.S. Fish and Wildlife Service, and the National Marine Fisheries Service. The small brown building in the Whittemore Recreation Area of the People's Forest is often called a "holding facility" for salmon, but that term belies the complexity of its role in anadromous fish restoration efforts. The facility is currently staffed by two full-time employees who live on-site, Joe Ravita and Andy Murrett, and one seasonal employee. Ravita has a degree in wildlife and fisheries from the University of Vermont and has been working at Whittemore since 1987. Murrett has a degree in fisheries from the University of Massachusetts. These highly trained men are responsible for every aspect of the salmon at the facility and they also work on developing new methods and tools that enhance the fish restoration efforts. For example, folks at the Whittemore facility have worked on improved handling and transportation methods to get the fish from the Rainbow Dam to the Whittemore facility. In the earliest days of the program, mortality varied greatly. Now, through improved techniques, equipment, and antibiotics that reduce the stress on the fish and ward off disease, nearly all the salmon that are brought from the Rainbow Dam survive to spawn. Photos above (May 2003)- At left, one of three primary salmon tanks at the Whittemore Salmon Station. This one is currently being used to house domestic salmon. At right, another of the three primary salmon tanks. This one is currently being used to house wild Atlantic salmon that were captured at the Rainbow Dam as they returned from the ocean. When it comes time for the fish to spawn in the fall, the Whittemore facility plays an active role in breeding, which has become increasingly sophisticated with the use of genetics. When fish return from the sea, tissue samples are taken and analyzed at a research lab in Massachusetts. Biologists are able to tell where the returning adult originally came from, when it was bred, and even its family origins. Genetic analysis is carefully considered in the breeding program at Whittemore, so genetic diversity can be best encouraged among the relatively small salmon population, thereby strengthening the species as much as possible. Although the majority of eggs produced during spawning are transferred to the White River facility in Vermont for incubation and hatching, about 400,000 eggs are now being incubated right here in Colebrook, in a special facility in the Goodwin Dam. This facility has been developed and maintained by the Whittemore crew in cooperation with the Metropolitan District Commission (MDC), who own and operate the dam. Of the 400,000 eggs incubated at this facility, approximately 250,000 become fry that are stocked back into the Farmington River, mostly in Barkhamsted and Hartland. The staff at the Whittemore Salmon Station has developed the Connecticut River Future Broodstock Eggbank as well. This facility incubates sea-run-origin eggs for use as domestic broodstock at the Kensington (CT) State Fish Hatchery. Eggs are taken from sea-run broodstock held at Whittemore and at the Richard Cronin National Salmon Station in Massachusetts, along with the kelts held at North Attleboro National Fish Hatchery in Massachusetts. These are crossed with milt (seminal fluid) from sea-run, kelt and precocious parr and incubated in quarantined environment until the "eyed" stage. Following a health screening of the "parents" to reduce the risk of pathogen transfer, the eggs are moved to Kensington to be reared to maturity as domestic broodstock. The Whittemore Salmon Station generally houses between 60 and 100 kelts. At present, they have salmon from the "classes" of 1997 through 2002. Atlantic salmon return from the sea at about four years old and live another four to six years at Whittemore. During that period, they may spawn as many as five times, though they become less productive as they age. The largest kelt now living at Whittemore is a 35-pound male. The largest fish to have lived at Whittemore grew to 52 pounds from his initial returning weight of 10 pounds. Recently, as the number of returning wild salmon has decreased, the extra space at Whittemore has been used to house growing numbers of domestic Atlantic salmon. These fish are held in a separate tank and are selected for their strong, broad genetic characteristics. The Whittemore Station has also worked with the local community. 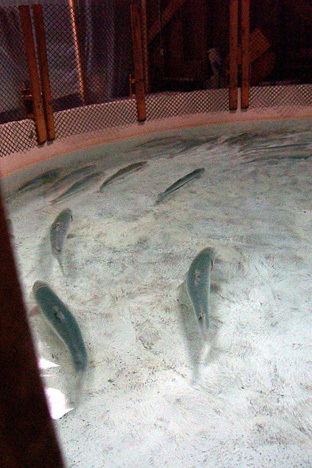 In May 2000, Ravita assisted the first large-scale salmon rearing effort in a Connecticut school when he delivered 400 of the Whittemore salmon fry to vo/ag students from Northwest Regional #7 High School's new aquaculture facility. In this program, initiated by teacher Jason Bassi and DEP biologist Steve Gephard, Ravita assisted the students throughout the year, and in the spring of 2001, they stocked the fish they had been raising into the local rivers, giving those fish the genetic imprint they needed to guide them on their return trip. One of their salmon smolts was observed migrating downstream at the Rainbow Dam, nearly 50 miles downstream from its release point in Winsted. Despite the re-signing of the Connecticut River Atlantic Salmon Compact, federal and state budget constraints are likely to affect just how the Atlantic salmon restoration program is carried out. Governor Rowland and the Connecticut legislature have yet to reach agreement on the state s budget for the 2003-2004 fiscal year, and cutbacks in some areas are assured, due to budget shortfalls reaching millions of dollars. As part of the ongoing budget wrangling, a plan to mothball Barkhamsted s Whittemore Salmon Station has already been drawn up. Whether it is put into effect or not depends upon the outcome of the current budget talks. This plan would actually place the facility in maintenance status. However, maintenance status would mean the current staff of two full-time employees and one seasonal employee would be relocated to other facilities, and the fish would be relocated as well, leaving the Whittemore facility empty and nonfunctional. The funding crunch is occurring at the national level as well as the state level. For example, Congress did not authorize funding for the Connecticut River Atlantic Salmon Commission (CRASC) during the CRASC reauthorization process. Conservationists who care about the salmon restoration to the Farmington River and Barkhamsted should urge their elected officials (both state and federal) to support efforts to properly fund this program. Interview with Joe Ravita at Whittemore Salmon Station, May 22, 2003.